A BOY who emigrated from Helensburgh to Australia at the age of just eleven went on to become one of the pioneers of early professional photography. Despite being orphaned soon after arriving Down Under, burgh-born Thomas Mathewson started a family dynasty in the photographic business. This is his story as told by one of his grandsons, Alan Reeve North, who has written a book about him. Thomas Mathewson was born in Helensburgh on September 7 1842, the fourth and youngest son of Thomas Mathewson and Mary Mathewson, nee Inglis. There were four children — John, Robert, Peter and Thomas, though a younger sister Helen had died as a young child. While Thomas was born in Helensburgh, the other children were born at St Cuthberts, Edinburgh. The family were residing at Plewlands, near Edinburgh, when a decision was made to migrate to Australia. The story which has been passed down through the years says that the two parents had contracted tuberculosis and it was believed that a cure could be found by a move to a more temperate climate. But there is no factual evidence to support that account of their move, which was such a big step to take into the future. Thomas was just under the age of 10 when the family of six travelled from Edinburgh to Liverpool to board the vessel ‘America’ for Australia. They left Liverpool on August 27 1852, arriving at Moreton Bay in Australia on January 10 1853 after a voyage of 135 days. Moreton Bay was then a Colony of New South Wales and was administered by British jurisdiction from Sydney. Moreton Bay gained its independence from New South Wales in 1859 and was renamed Queensland with its capital city Brisbane. After arrival at Moreton Bay, the father was offered employment on a cattle and sheep property called ‘Warkon’ in the Surat/St George area of south-west Queensland. The only means of travel was by bullock wagon and dray, a journey of 300 miles or more which took over six weeks. That journey must have called upon a lot of physical endurance in the rugged bush setting of early Australia which would have been very demanding. The family remained on the property for only one year after which they returned to township living at Ipswich, which at the time was thought would become the capital city of Queensland. The report states they found the very hot climate in summer too depleting, while they also faced hazards from the aboriginals. How very different the climatic conditions would have been from anything which they had experienced in Scotland. Thomas’ father died on December 16 1854 and his mother on March 23 1855. The cause of death of his mother was stated as ‘disease of the heart’ which raises a question about the tuberculosis story. The cause of death of his father has not yet been found. Young Thomas was just 12 years of age when his parents died. In Scotland, the family belonged to the Church of Scotland, but in Australia they joined the Congregational Church which had a strong presence in Ipswich. Church life presented young Thomas with educational and employment opportunities which he seized to better his position. It introduced him to some very wealthy families, amongst whom were the Cribb and Foote families, who were to steer him along the road of independence and success. He took a great interest in civic affairs, serving on the Council of the Historical Society of Queensland for 16 years. He was a Councillor in what was later to become the Brisbane City Council which is the local government authority which services Brisbane, the capital city of the State of Queensland. For many years, he was the Patron of the Queensland Professional Photographers’ Association. 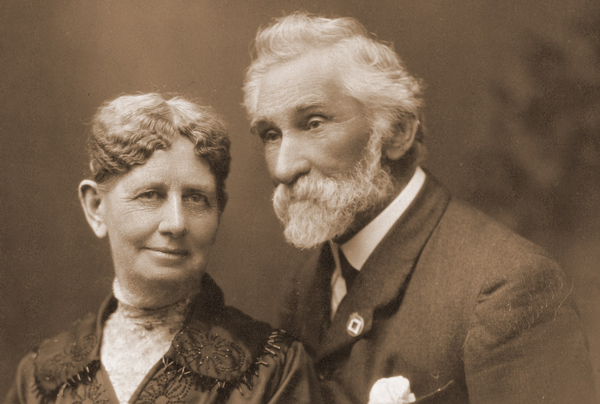 Thomas married Jane Barker Reeve on September 22 1880. She was the daughter of Henry Martin Reeve, from Suffolk, England, and Mary Ann Reeve, nee Barker. The Barker family had migrated to Sydney from Armagh, Northern Ireland, in 1839. Several of the Barker family became prominent in legal circles in Sydney. Thomas first met his bride at the Ipswich home of her parents while she was still a babe in a cradle. Thomas was trained as a carpenter in his teen years, but soon grasped the opportunity to express his talents in design and artistic work. He became a leading Queensland Photographer and was known as the ‘Father of Photography in Queensland’. Thomas seemed to possess a real pioneering and adventurous spirit as his travels between Brisbane and Sydney and Brisbane and North Queensland indicate. Before his marriage, he travelled extensively with his camera and equipment. In the years between 1864 and 1876, he opened many Photographic Studios throughout Queensland which included the place names of Ipswich, Toowoomba, Dalby, Maryborough, Gympie, Rockhampton, Charters Towers, Townsville and Bowen, all of which later became provincial towns and cities. Between the years 1865 and 1867, he became a travelling photographer, with the horse and dray as his mode of transport, from Toowoomba, Queensland, to Sydney, via the Darling Downs and inland places. After all these travels, Thomas settled for a more comfortable life in Brisbane and opened studios in the Brisbane central business district, always operating in Queen Street, the main business centre. His Brisbane studios went through a number of name changes, such as Mathewson Photographic Artist, Mathewson & Co., and Thos Mathewson & Co. He practised photography in Brisbane from 1876 to 1922 when he sold the business to two of his staff whom he had trained, Cooper and Gillespie. The business was then renamed Regent Studios. Governors of the State of Queensland were invariably patrons of the firm of Thos Mathewson & Co., and their photographs were mostly taken by Mathewson. Thomas never lost his Scottish accent nor his interest in his homeland. His three homes bore the names of places which were known to him in Scotland. There was one home named Cardonald after a suburb of Glasgow; another home was named Comiston after a suburb of Edinburgh. His last residence was named Caligule, though the source of that name has not been discovered. He is thought to have designed the several Brisbane residences in which he lived, as well as a church for his community. Thomas worked in partnership with his brother Peter, whom he trained, from about 1878 to 1892 when the partnership was dissolved. Peter then established his own studio in another area of Brisbane, known as Petrie Bight. The business was eventually handed over to his sons and became known as Austral Photographic Co., and was later extended to some of Queensland’s northern towns and cities over the years. His son John Trevallon Mathewson, known as Jack, worked in his father’s studio from about 1910 until he enlisted in the Australian Flying Corps in World War One and served overseas in France and the UK from 1916 to 1920. His father had hoped that his son would carry on the business, but instead Jack Mathewson became a missionary in China from 1924 to 1927. When foreigners were forced to leave China in 1927, it was reported that his son Jack had been murdered by tribesmen near the border of China and Tibet. A Memorial Service was held in Brisbane to commemorate his life, but some time later a message was received to say that he was still alive. Thomas’ three daughters, Ethel, Glis and Allison, were all trained in their father’s studio and worked as touch-up or graphic design artists. Marriage brought their employment to a close as custom dictated that women could not work after marriage. Being of Scottish decent, his son Thomas Henry Reeve Matheson, known as Harry, was eligible for a Carnegie Scholarship. Harry commenced study for his medical degree at the University of Edinburgh in 1905 and graduated as a Doctor of Medicine in 1909. He returned some years later to Edinburgh for post-graduate work. Harry was a great supporter of the medical needs of the extended families and treated them without cost. Robert Mathewson was the second son of Thomas Mathewson and Mary Mathewson, nee Inglis. His elder brother was John and the two younger brothers, Peter and Thomas. Robert was the only member of the Mathewson family who did not come to Australia. He had two sisters, Helen and Mary, though Helen died as a young child. Robert was born at St Cuthberts, Edinburgh on September 25 1835. He married in 1860 (no date known) and died on July 29 1925. He married Alison Ramsay Davidson who, it is believed, was the sister of an Archbishop of Canterbury, Archbishop Randall Davidson. It is also understood that Robert tutored Randall Davidson in his younger years. 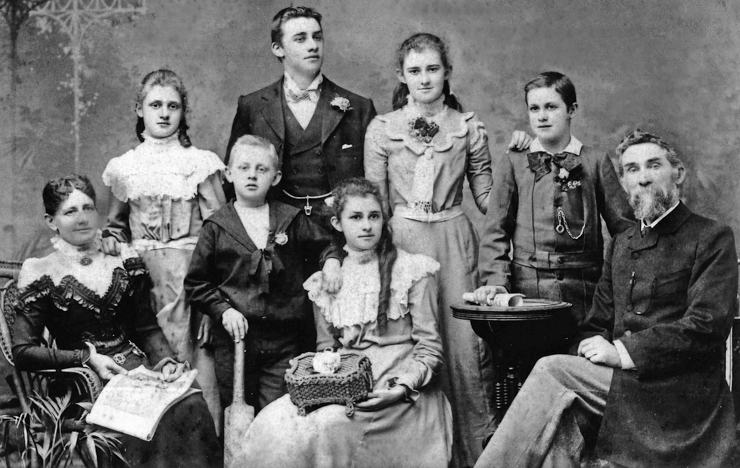 The five children of the Mathewson/Davidson family were: Mary Alice, who married Dr Charles Rea; Helen Elizabeth; Isabella; Thomas Ramsay, who migrated to Brisbane; and Robert. “Robert Mathewson MA who died at Leith this week at the ripe age of 90 years was a native of Edinburgh. After receiving his elementary education at Helensburgh, Mr Mathewson returned to Edinburgh and served his apprenticeship as Pupil Teacher in the Morningside Parish School and also received his normal training. “During his course at Edinburgh University of which he was a graduate, he had the distinction of tutoring Randall Davidson, the present Archbishop of Canterbury. "A teacher of marked ability and success, Mr Mathewson held important appointments as Second English Master of Madras College, St Andrews 1860 to 1870; Head English Master of Queen Street Ladies’ College, Edinburgh 1870 to 1877; Head English Master of Bellahouston Academy, Glasgow 1877 to 1884; and Headmaster of Causewayside Public School, Edinburgh 1884 to 1904 when, a few years above the age limit, he retired on pension. "Mr Mathewson throughout his professional career possessed the confidence and high esteem alike of pupils, parents and fellow teachers, as was evidenced by the presentation to him of a gold watch and chain when he left St Andrews in 1870." “I must tell you I’ve had the pleasure of visiting a place where we spent five years of our life, Helensburgh. I left Edinburgh on the morning of September 18 and on Friday saw through a good part of Glasgow. It is really a perfect London compared to Edinburgh and the places of business are amazingly extensive. I had no idea before of its size. Very sadly, the remainder of the letter is missing. How wonderful it would have been to have the story of Robert’s visit to Helensburgh. There were eulogies during his lifetime that Thomas Mathewson had left the tracks of his tripod — in the days of wet plate photography — in every inhabited place from Queensland’s Great Barrier Reef to the ‘never never’ of the Australian bush; that Mathewson must have worked for half the families in Queensland; that his was truly a household name in the history of early Queensland. These inspired his grandson Alan Reeve North to make the decision that a book needed to be written to document this history for posterity. That book was published in 2005 and has the title “Thomas Mathewson Father of Photography in Queensland", with the sub-title "An Early Pioneer, Photographer, Historian 1842 to 1934”. Credit must go to his grandson Jack Mathewson of Toowoomba who devoted many years to research the Mathewson history in Scotland from the 17th century until today, sometimes becoming confused with the variations in spelling of the surname, be it Mathison, Mathieson or other spellings. It is gratifying that a grand-daughter of Jack Mathewson, Dani Mathewson, and a daughter-in-law, Sharyn Mathewson, have followed in the steps of Thomas Mathewson as professional photographers. His life came to a close in Brisbane on May 12 1934. His life story still lives on in the numerous, seemingly hundreds of historical articles which he wrote for the Brisbane newspapers. Easier access to some of that hidden material now comes from the recent digitisation of the newspapers of his times to keep the name of Thomas Mathewson alive. That Thomas Mathewson should be so frequently eulogised by his peers in the years before his death is a great tribute to this remarkable citizen, the boy from Helensburgh. This article was kindly supplied by Thomas Mathewson’s grandson, Alan Reeve North, of Canberra, Australia, author of the book about Mathewson’s life and times. 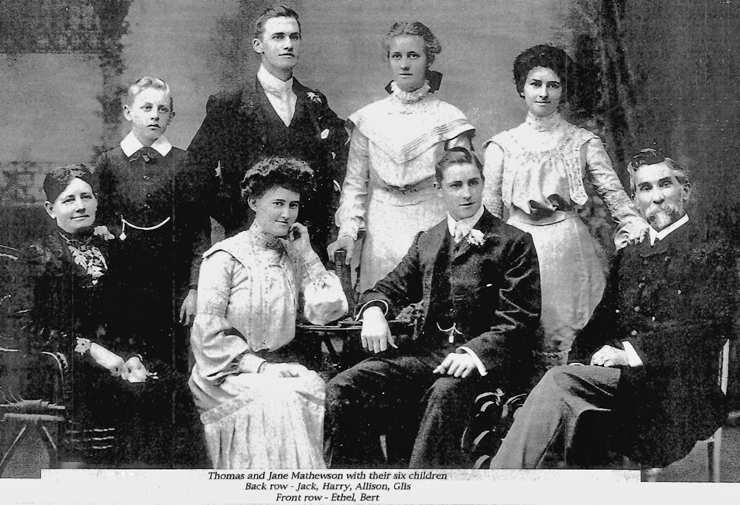 He also provided the picture of Thomas and his wife (1922) and the family photos (1897 and 1903).